The White House has been tight-lipped on the proposal, which is expected to be released in the coming months. Media reports say it represents an "unconventional approach" based on a realistic reading of the situation. Donald Trump's long-awaited peace plan for the Middle East is coming out of hibernation after Benjamin Netanyahu's election victory, and it is said to be likely to sweep the Palestinian statehood issue under the carpet. In drafting the plan, the US president's administration has relied heavily on his point man for the Middle East, Jared Kushner. The Washington Post reports, citing US and Arab officials familiar with the matter, that Trump's son-in-law is looking to preserve Israeli control over the Palestinian territories and includes Palestinian "autonomy" but not a sovereign Palestinian state. An unnamed senior White House official said that the plan is "fair, realistic and implementable" and that it reflects reality. "We looked at past efforts and solicited ideas from both sides and partners in the region with the recognition that what has been tried in the past has not worked. Thus, we have taken an unconventional approach founded on not hiding from reality, but instead speaking truth." The Trump administration has been working on the plan for over two years now, but its highly-anticipated release had been delayed in the light of Israel's parliamentary election earlier this month. Now that Trump's ally Netanyahu is poised to continue to rule under a coalition government, the US administration could unveil the plan any time soon. "The fact that Bibi won, I think we'll see some pretty good action in terms of peace," the US president said after Netanyahu's victory. "Everybody said, and I never made it a promise, ‘you can't have peace in the Middle East with Israel and the Palestinians'. But I think we have a chance, and I think now we have a better chance with Bibi having won." "We are still weighing a variety of factors," the WaPo quoted a US official as saying. "Timing is still being worked out, and no decision has been made at this time as to when we are going to roll it out." Under Donald Trump, the United States has endorsed Israel on several controversial points. Washington has recognised Jerusalem as the capital of Israel, moving the local US embassy to the disputed city, and has okayed Israel's sovereignty over the occupied Golan Heights, which are recognised by the UN as remaining part of Syria. 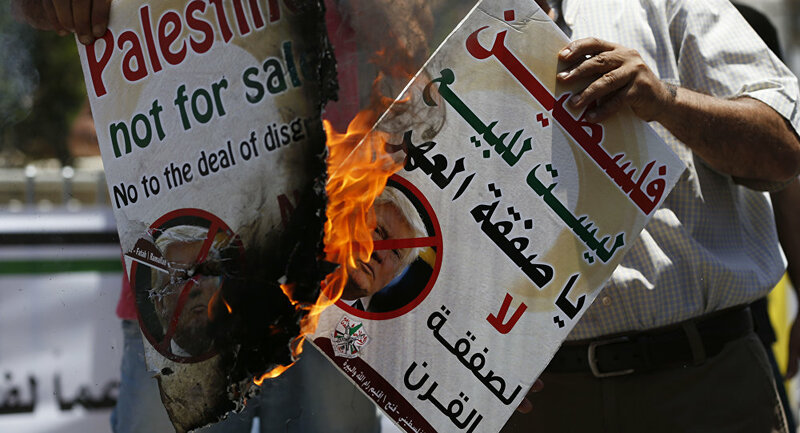 These moves have drawn condemnation from Palestinians and sparked speculation that the plan would be biased toward Israel; Mahmoud Abbas has denounced the peace package as the "slap of the century" and promised to reject it. Meanwhile, three dozen former EU leaders and top diplomats have called on the bloc to stick to a two-state solution to the conflict. "Unfortunately, the current US administration has departed from longstanding US policy and distanced itself from established international legal norms. It has so far recognised only one side's claims to Jerusalem and demonstrated a disturbing indifference to Israeli settlement expansion," they wrote in a joint letter to EU foreign ministers. "We believe Europe should formally reaffirm the internationally agreed parameters for a two-state solution. Doing this in advance of the US plan establishes the EU's criteria for supporting American efforts and facilitates a coherent and unified European response once the plan is published." Last year, UN Secretary-General Antonio Guterres also urged Israelis and Palestinians to support the two-state solution plan, which would establish Jerusalem as the capital of both sovereign countries.